The Greek vessel PIRROS ( possibly PYRROS ) on the scrap metal berth in Tilbury on 18/3/87. RWJ ? 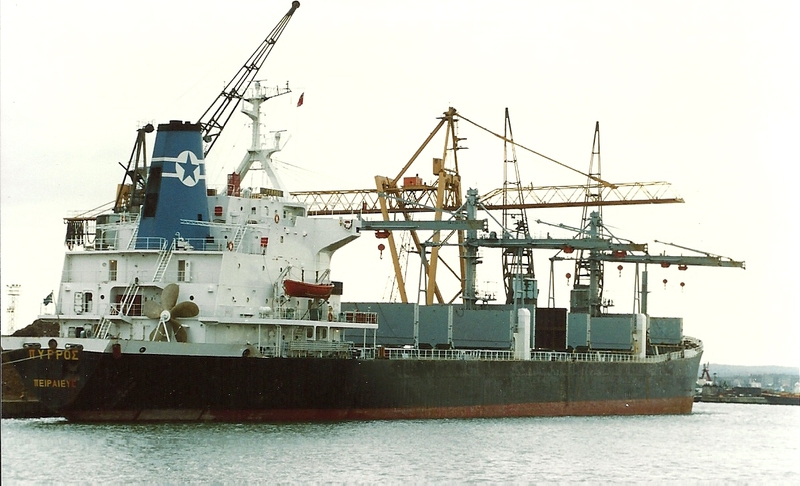 The larger-than-average general cargo vessel PYRROS (14,072 tons gross; 22,670 deadweight), was completed at Kure, Japan, in 1977 for a Japanese owner as FORTUNE LEADER. 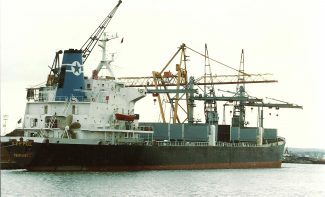 In July 1985 she was bought by Sea Frontier Maritime Inc, of Liberia, and placed under the Greek flag as PYRROS and managed by Seastar Navigation Co Ltd, of Piraeus, Greece. PYRROSremained with them for just over a year and was sold to become FAREAST LEADER. She had five more names and the same number of owners before being broken up at Chittagong, Bangladesh, in 2010. In the meantime, however, her fortunes had “temporarily” taken a turn for the worse. In 1996 she was bought by China Ocean Shipping and was under the name WAN LING. It is clear from many reports that her general condition was then in decline. In 1996 she was detained in both Australia and the United States for numerous safety violations, all of which were rectified. In the following year, there was another detention in the USA because of numerous important defects. And in 1998 there was a further problem when she was prevented from leaving Honolulu because, among other things, of a 7-inch fracture in her hull. After the 1998 problem, there were no more reported incidents.